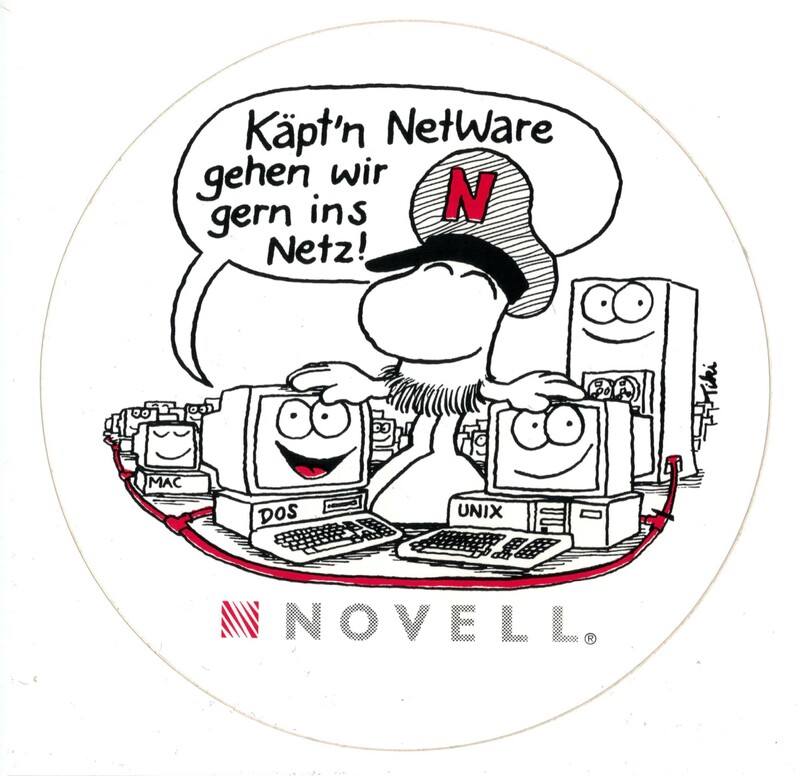 Remember when the Novell Unix client was everywhere? Remember when IPX/SPX was a thing? I could also call this ‘going with the flow’… So instead of fighting the system, like I usually do today we are going to do things the way everyone else enjoys doing things, and that is building stuff with tun/tap and bridges. Ok, so I’m using Windows, and that is what I’m assuming you are as well for this ‘guide’. The first thing you’ll need is the tun/tap driver for Windows, and the easiest way to get that is via OpenVPN. The next thing you’ll need is Qemu, again I’m just using the pre-compiled stuff right here. Now for my example, I’m going to add another TAP interface. TAP’s are only good for a 1:1 relationship with the VMs. Yes, that is why I prefer something else, but again we are going to do things today the way everyone else does them. Now for me, I run the ‘addtap’ batch file located in the C:\Program Files\TAP-Windows\bin folder as Administrator, and this now gives me two TAP adapters. 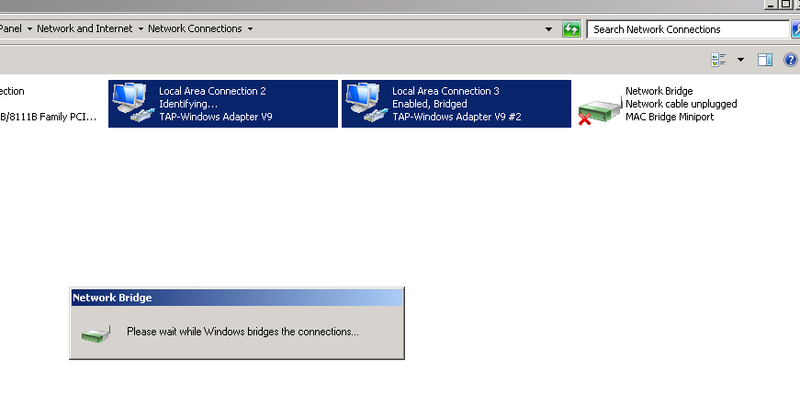 I highly recommend disabling TCP/IP v4 and v6 on the TAP adapters, along with the MS client/server stuff. 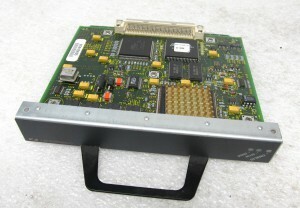 We are only using these for bridging the VMs so we dont’ need the host computer to participate in this network. Now for the fun part. I’m assuming you have your NetWare server and client images all ready to go (I guess I can go over installation again some other day), and now we get to bind each one to a SINGLE TAP instance. Also don’t forget that each machine needs a UNIQUE MAC address. One of them can use the default settings, but the other one cannot. As you can see, this gives me a NE2000 on port 0x300, IRQ 10 and sets the MAC address to 52:43:aa:00:00:11 . And this sets it on the first TAP adapter, lovingly called “Local Area Connection 2″ because the primary adapter is called “Local Area Connection“. Also take note of the quotes in this command line, as it’ll encapsulate the full default name of the TAP adapter. The other alternative is to just rename the adapters, but where is the fun in that? As you can see the primary difference here is that it’s connected to “Local Area Connection 3” which is my second TAP interface. 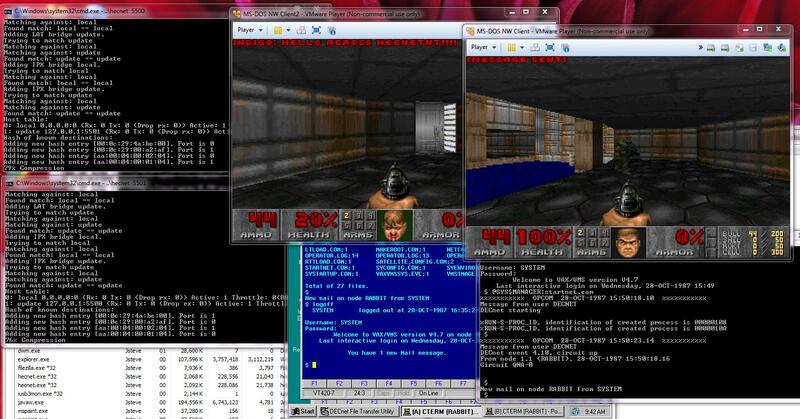 Now with both virtual machines running the interfaces will turn on! But as you’ll quickly discover, neither machine can talk to each-other, as they are islands so to speak. Two virtual machines on islands. Now for the fun part, we highlight the two TAP interfaces, right click, and turn on the built in bridge function of Windows! And once that is done, a new Network Bridge interface will show up, transfer what layer 3 settings there are, and then setup the layer 2 bridge between the TAP interfaces. And once the bridge interface has gone live, give spanning tree 15 seconds to do it’s thing, and YES you can now login to the NetWare server! And there you go! This is the ‘approved’ way to do virtual networking with Qemu. Now I know what you are thinking, this is great for VM’s and all that jazz, but what if I say have an office FULL of old PC’s and I want them onto my new fangled ancient server? No problem, right click on the bridge, and select delete. This will put everything back the way it was, sending the VMs back to their own TAP interfaces. Now select all the interfaces, and then setup a bridge (I suppose you could edit the existing one to include the physical interface…) and now once the bridge has been setup, it’ll now be talking out the local Ethernet interface. One quick note, bridging and WiFi tend to not go hand in hand. Some interfaces will work, but the rule seems to be the vast majority of setups will not. So don’t complain if yours didn’t work, you are just part of the 99.99999%. And if you did get yours to work, well good for you. 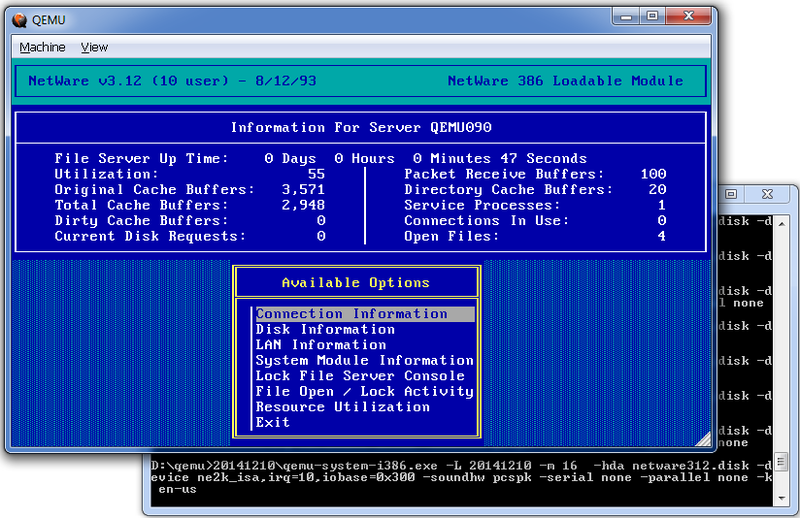 Novell Netware 3.12 once more runs on Qemu! This version of Qemu seems to be one of the better ones in a LONG LONG time. Much to my amazement, as I fully expected this to crash much like all the other versions, it actually runs. I’m just more amazed it works. Now I did try it on my old setup of a NE2000 on 0x300 Interrup 2/9 but I was getting some IRQ issues. So I went ahead and reconfigured Netware for IRQ ‘A’, and set the CLI for 10. Of course I haven’t actually tested networking, this is really a ‘wow it did something’ statement. 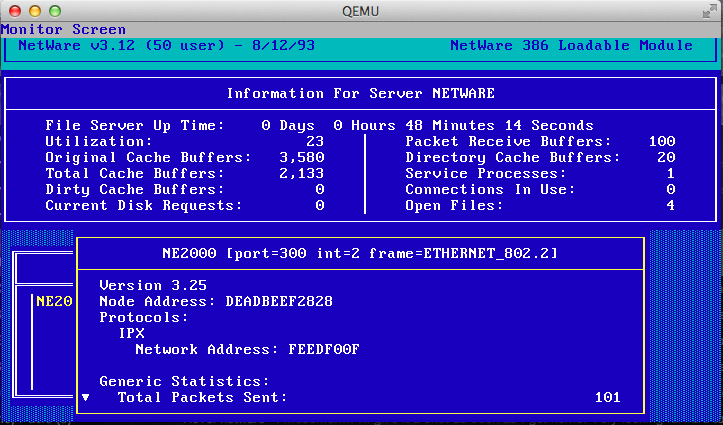 No doubt I’ll have to build a new GNS3 test bed with this Qemu, and see how Netware performs. 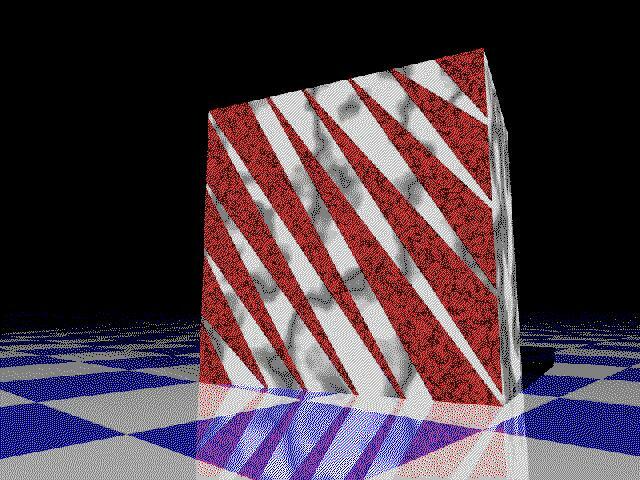 Author neozeedPosted on January 15, 2015 April 14, 2017 Categories netware, Novell Netware 3.12, qemu, virtual networking10 Comments on Novell Netware 3.12 once more runs on Qemu! 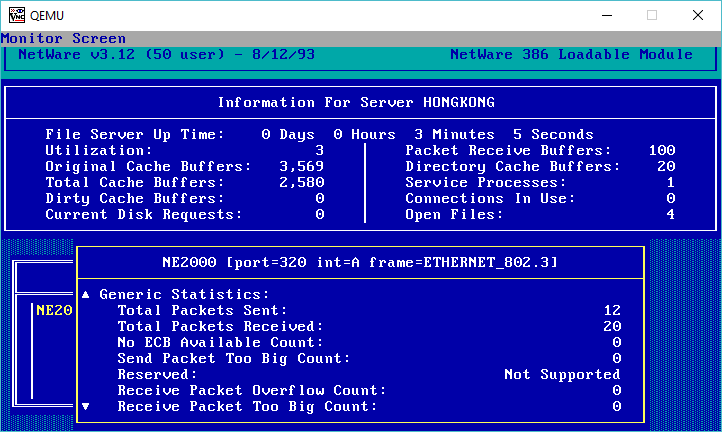 So continuing from where I left off, I thought I’d setup a small Netware network onto my GNS3 testbed. Netware was once the big dog in the networking world, but now it’s just a footnote in obscurity. Long gone are the days of syscon, rconsole, and all the frametypes that Netwaer supported in equally incompatible ways. So maybe it’s a good thing. But I digress, years ago I paid good money for a 50 user version of Netware 3.12. I don’t know why either, but I occasionally like to get it running so I don’t feel like I completely wasted the thing. Which gets me networking, and rconsole support. With the server running, I just then had to enable IPX routing on my cisco routers. 4 Total IPX routes. Up to 1 parallel paths and 16 hops allowed. And of course I can see the server! Now if you remember from the bad old days of Netware, each service running on a server is advertised. So in this case, type 4 is a file/print server, and 107 is a server running the ‘remote’ facility so you can rconsole into it. Another thing to take note, is that because I configured IPX on serial interfaces is that their encapsulation is always HDLC. Also because IPX cannot fragment like TCP/IP the MTU on the serial interface *MUST* be larger than ethernet’s 1500. I like 2000 as I avoid all frame overhead this way. Now I’m using the old netware client with the drivers I found here, and it works fine, as long as I had the MTU bumped up on the serial interface. Now I could have used ethernet, and it’d achieve the same thing, except I’m not in some weird MTU war. At the same time, it is very slow. If you want to do anything reasonably fast, you really need to move your client to the same VNet as the server. But if you want to feel like the old days when connections were slow, well you’ll enjoy a max 400k connection. I tried enabling stacker compression on the interface, but it resulted in packet corruption. I think it’s an IOS thing though, so if you play with this, you may have better luck. Back before MPLS was everyone’s latest wan joy, I ran stacker compression, and the speed boost was really noticeable, with a 1.5:1 or 2:1 compression not being uncommon. Although on lower routers it could be a killer (the 2500…) or a 7000 with multiple interfaces doing compression it could also bring a router to it’s knees. Also looking at the support table for the SA-COMP/1 SA-COMP/4 I doubt 12.4 would support stacker compression properly. Otherwise, yeah it works fine. I also loaded up a Windows NT client, and it works too! So I received an interesting tip, talking about the latest Qemu version, when it was mentioned that it isn’t the hardware that is at fault with Netware not running, but rather something in the emulated CPU. Because, get this, Novell Netware runs in KVM. I was taken back, all this time I thought it was something in the -M isapc definition that broke, but it’s the CPU! I even rebuilt Qemu with the TCG interpreter, and it too breaks. I even went one more crazy step, and installed with the ancient isadisk controller, and NE2000 on the ISA bus, and it works! So for now my old copy of Netware I bought a million years ago lives in the cloud! I managed to come across this link, which details some installation experience with Netware 3.12 on VMWare. What is more interesting is that someone mentions that it’ll run on VirtualBOX! So downloading their toolset and whatnot I proceed to install on VirtualBOX, and get a booting Netware 3.12 system using the ISADISK driver… I couldn’t find the IDEHAM thing but you get the idea, it actually WORKS! 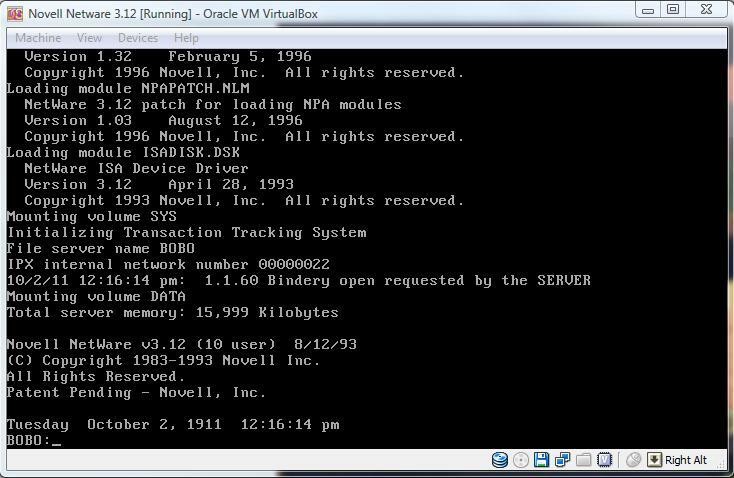 Novell Netware 3.12 on VirtualBOX! The usual panic/crash after mounting a disk volume. 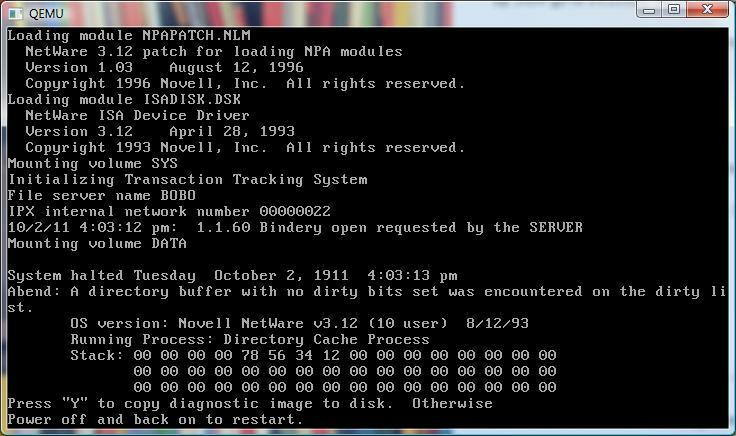 Its a damned shame, but hell at least there is something out there that can run Novell Netware!!! Once upon a time Novell had been an unstoppable force. Then something happened they stopped innovating, and laughed as a ‘desktop’ unix killer did just that and ate the mid range/server PC market. With all that’s been happening to RIM and all the cash they are sitting on I wonder if they’ll end up like Novell.